Hamburg/Linz, August 7, 2015: It’s a world premiere. 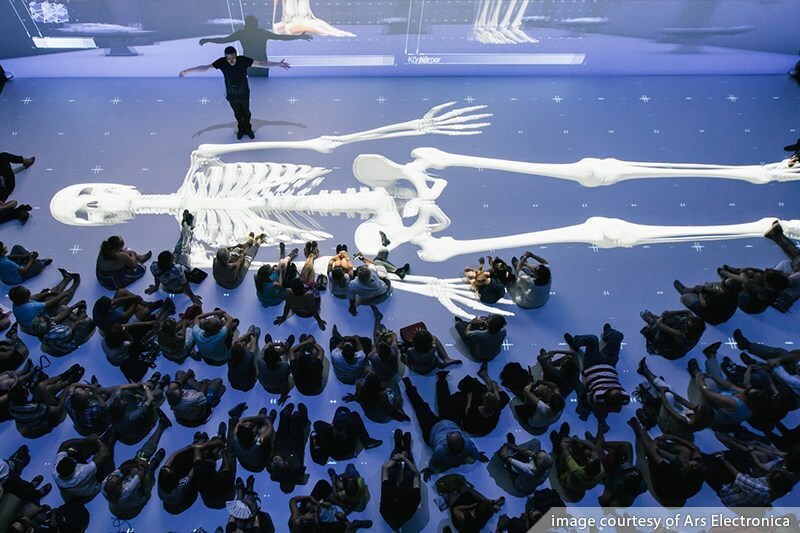 For the first time, the renowned Ars Electronica Center presents stereoscopic and interactive content in 8K resolution at up to 120 Hz refresh rate – in real-time. Two CX4 high-performance computing workstations by XI-MACHINES form the core of a technically ambitious and complex exhibit. The exceptional “Deep Space” exhibit at Ars Electronica has already staged many unique 3D visualizations over the years. 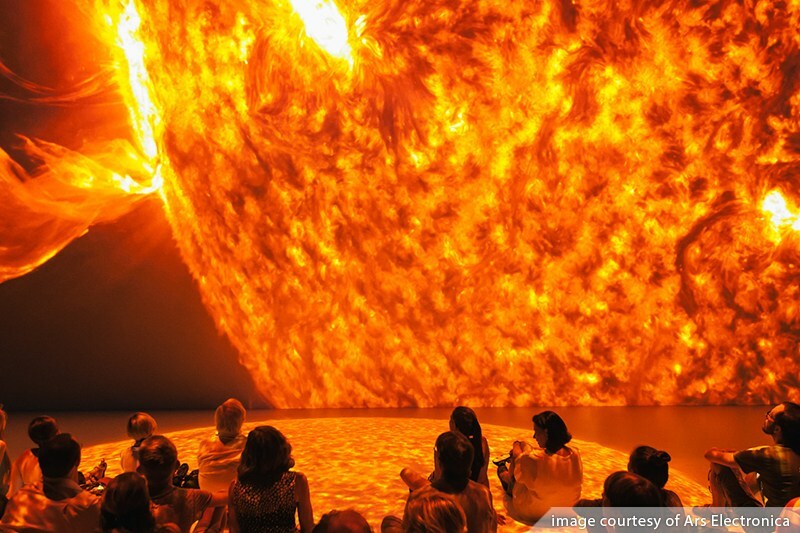 Yet with its new conceptual design, “Deep Space 8K” now offers not only science presentations on the structure and functions of the human body, or enormous 3D point clouds offering breath-taking depictions of ancient Rome, but also stunning solar activity video sequences by NASA. 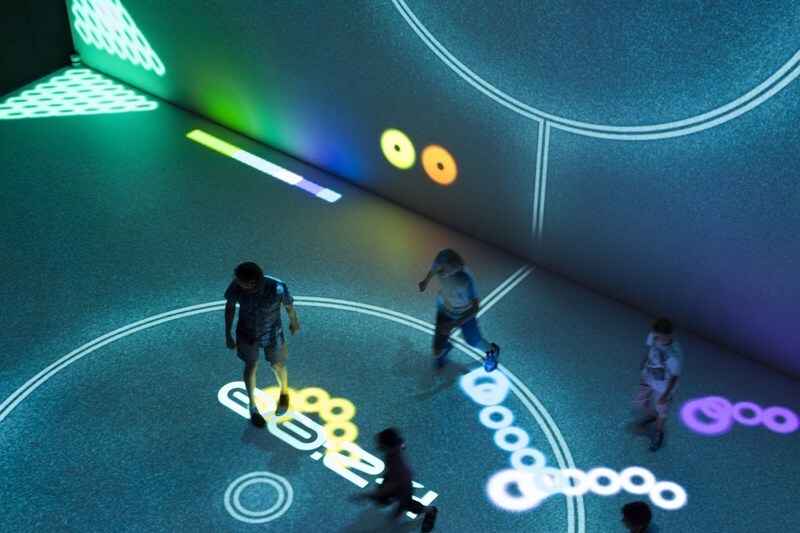 Visitors can also engage with movement-controlled multi-player games thanks to a newly developed laser tracking system. “Deep Space 8K” boasts an impressive projection area covering a wall and floor space, each 16 by 9 meters. 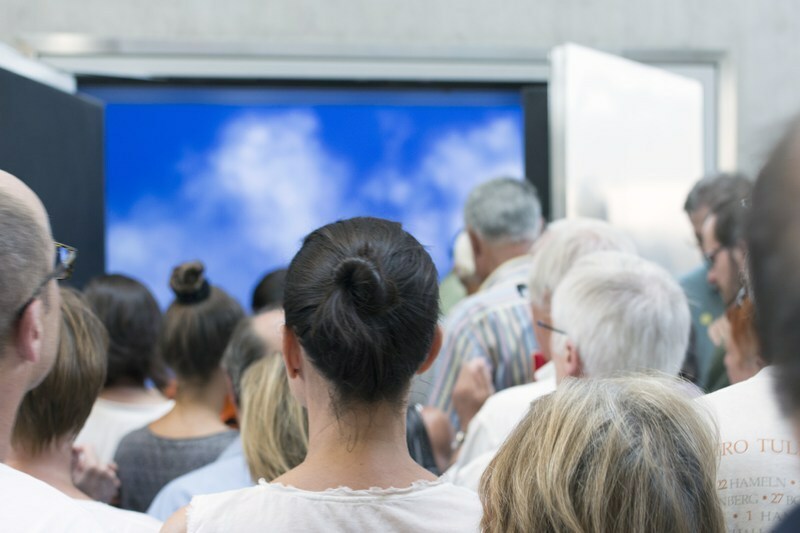 In a world premiere, award-winning high-resolution pictures, videos and interactive 3D animations are projected in real-time with a refresh rate of up to 120 Hz. This is made possible through two synchronized CX4 high-performance workstations crafted by XI-MACHINES. The system is capable not only of rendering and displaying visuals in 8K resolution, but at the same time computes data in real-time from the “Pharus” laser tracking system which collates the coordinates of up to 30 people playing interactive games on the projection space. Our workstations are often used for real-time 3D projection onto large areas. 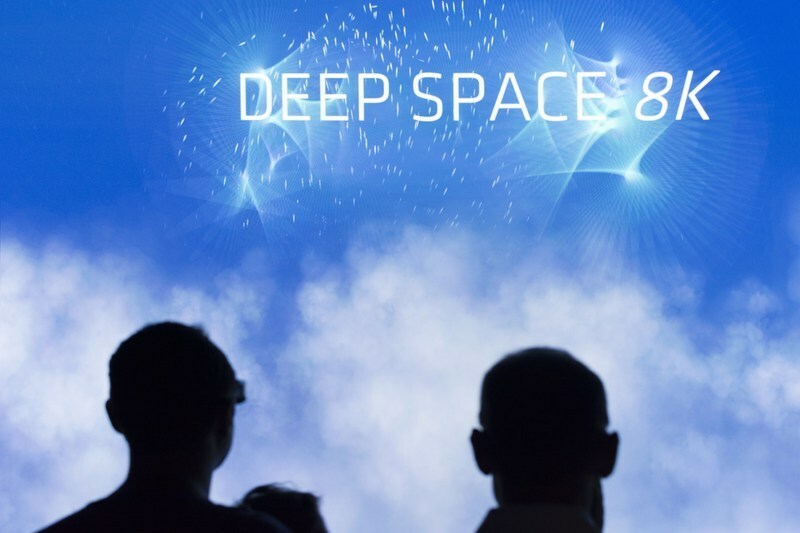 Until now, it wasn’t possible to display the current “Deep Space 8K” Super Hi-Vision content in real-time with high levels of detail as a 3D projection. For us, what was special about this unique project was the technical challenge of how to output videos, pictures, 3D animations in 8K resolution at a refresh rate of 120 Hz while simultaneously computing tracking data, all in real-time, day for day in a working museum. The resulting data stream of 23 gigabytes per second is enormous, and is roughly equivalent to the capacity of a Blu-ray disc. You can only process this amount of information if you employ the latest hardware. 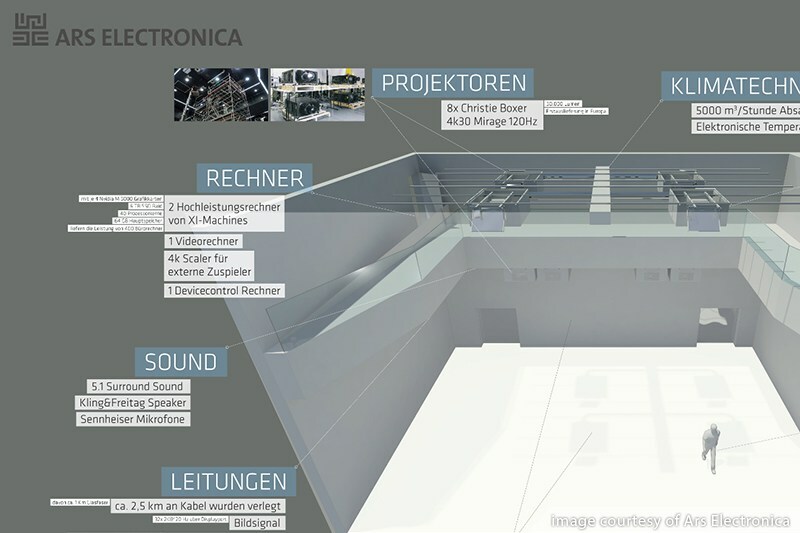 After exhaustive testing and in close consultation with the developers at Ars Electronica Future Lab, we custom-built a system around two CX4 high-performance computing (HPC) workstations, with high-end graphics accelerators that provide synchronized picture projection for both display areas. Each of the two systems provides a computing power of approx. 25,000 GFLOPS, that’s the equivalent of around 200 conventional office computers! Both CX4s generate video data for a total of eight Christie Mirage 304K projectors, each offering 4K resolution, and displaying visuals on the wall and floor at an impressive 30,000 ANSI Lumens, with a contrast of 2000:1. And the results are astonishing. These are razor-sharp images, with zero-flicker 3D animations that guarantee a visual experience you won’t find anywhere else in the world. It’s a striking demonstration of how science, art and modern technology can combine in fascinating ways. The powerful CX4 workstations developed for “Deep Space 8K” utilise two latest generation Intel XEON E5 processors, with each using four synchronized NVIDIA Quadro M6000 graphics accelerators with a total of 48 GB graphics RAM; all this technology combines to allow synchronized projection of 3D content at 120 Hz.